For other places with the same name, see Pittsburg (disambiguation). Pittsburg is part of the Berlin, New Hampshire–Vermont Micropolitan Statistical Area. Pittsburg derives its name from William Pitt, Prime Minister of the United Kingdom. Prior to its incorporation in 1840, the area was settled c. 1810 and known as the Territory of Indian Stream. It had the unique distinction of having been its own microstate briefly during the 1830s, called the Republic of Indian Stream, due to an ambiguous boundary between the United States and Canada. Pittsburg shares an international border with Québec province, Canada to its west and north, and borders the states of Maine (to the east) and Vermont (a very small portion to the southwest). Directly to the south is Clarksville. 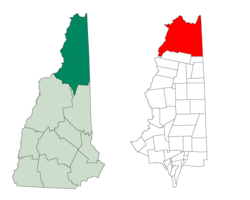 Pittsburg is the only New Hampshire municipality to border Canada, the only one that borders both Maine and Vermont, the only one to share a land border with Vermont, and the only town entirely north of the 45th parallel. Pittsburg contains the only part of New Hampshire west of the Connecticut River, as that river defines the Vermont state line from Clarksville southward. The Pittsburg-Chartierville Border Crossing, New Hampshire's only Canadian border crossing, is located in the town, at the northern terminus of U.S. Route 3. The western edge of Pittsburg is defined by Halls Stream, being the "northwesternmost headwaters of the Connecticut River", which defined (ambiguously) the border in the Treaty of Paris of 1783. Contained within the boundaries of Pittsburg are the Connecticut Lakes, which form the beginning of the Connecticut River. Early maps (e.g. 1854) also show several grants that were incorporated into the eastern edge of Pittsburg, including Carlisle No. 1, Webster/Carlisle No. 2 and Hubbards No. 3, all north of Atkinson and Gilmanton Academy Grant. According to the United States Census Bureau, the town has a total area of 291.2 square miles (754 km2), the largest of any municipality incorporated as a town in both New Hampshire and New England. A total of 281.4 square miles (729 km2) is land and 9.8 square miles (25 km2) is water, the latter comprising 3.37% of the town. The highest point in Pittsburg is the summit of Stub Hill, at 3,627 feet (1,106 m) above sea level. Mount Magalloway, 3,383 feet (1,031 m) above sea level, is a prominent summit reachable by hiking trail. As of the census of 2000, there were 867 people, 386 households, and 264 families residing in the town. The population density was 3.1 people per square mile (1.2/km²). There were 1,281 housing units at an average density of 4.5 per square mile (1.8/km²). The racial makeup of the town was 98.27% White, 0.12% African American, 0.58% Native American, 0.23% from other races, and 0.81% from two or more races. Hispanic or Latino of any race were 0.46% of the population. There were 386 households out of which 22.3% had children under the age of 18 living with them, 59.1% were married couples living together, 4.4% had a female householder with no husband present, and 31.6% were non-families. 26.7% of all households were made up of individuals and 14.8% had someone living alone who was 65 years of age or older. The average household size was 2.24 and the average family size was 2.67. In the town, the population was spread out with 18.9% under the age of 18, 5.4% from 18 to 24, 23.8% from 25 to 44, 32.9% from 45 to 64, and 19.0% who were 65 years of age or older. The median age was 46 years. For every 100 females, there were 105.9 males. For every 100 females age 18 and over, there were 105.6 males. The median income for a household in the town was $38,516, and the median income for a family was $42,500. Males had a median income of $31,250 versus $25,455 for females. The per capita income for the town was $17,703. About 5.0% of families and 7.4% of the population were below the poverty line, including 7.8% of those under age 18 and 11.5% of those age 65 or over. In 2014 the largest ancestry groups reported in Pittsburg were English (30.9%), French or French Canadian (21.0%), Irish (9.8%), and "American" (9.2%). Pittsburg is a mecca for snowmobile and ATV enthusiasts year round. In the winter months thousands of people flock to Pittsburg to take advantage of the state-funded and club-supported and maintained trails that can bring snowmobilers from anywhere in the state of New Hampshire to Pittsburg, with access to the states of Maine, Vermont and the border crossing to Canada. Some of the same trails are used in the summer for ATVs. Check the Pittsburg Ridge Runners Snowmobile Club and the Great North Woods Riders ATV Club web sites for further information. Also, for weather information specific to the First Connecticut Lake in Pittsburg check John's NH Weather for current conditions, forecast and much more. Another focus in the area for tourists is fishing and hunting. Pittsburg is home to the four Connecticut Lakes, Back Lake, part of Lake Francis, and numerous smaller water bodies. The lakes are annually stocked with fish and allow for weekends of good fishing. The area is known for fly fishing. Two sections of the Connecticut River are fly fishing only, including the "Trophy Stretch". The Connecticut Lakes Region has attracted anglers and hunters since the turn of the century. There are maps on the local snowmobile club's website that can be helpful in planning a trip to the area. It shows all trails in Pittsburg as well as roads and access points to the lakes and rivers. Lake Francis State Park allows for lakeside camping, fishing, and canoeing on the lake or the Connecticut River. Deer Mountain Campground enables camping and picnicking on the Connecticut River. Pittsburg will fall within the path of totality during the solar eclipse of April 8, 2024. ^ "Geographic Identifiers: 2010 Demographic Profile Data (G001) – Pittsburg town, New Hampshire". U.S. Census Bureau American Factfinder. Retrieved November 8, 2011. ^ "People Reporting Single Ancestry: 2010–2014 American Community Survey 5-Year Estimates (B04004); Pittsburg town, Coos County, New Hampshire". American Factfinder. U.S. Census Bureau. Retrieved October 3, 2016. ^ "April 8, 2024". Total solar eclipse of Aug 21, 2017. Retrieved 2017-08-22. Wikimedia Commons has media related to Pittsburg, New Hampshire.